*Note that Governor Ventura is a member of the Independence Party of Minnesota; he left the Reform Party during 2000. **DFL stands for the Democratic Farmer-Labor Party, which is the Democratic Party in Minnesota. IR is the abbreviation of the Independent Republican Party, which is Minnesota’s GOP. The deadline for both congressional and legislative redistricting is 25 weeks before the state primary election in 2002 -- in the upcoming cycle, the deadline will be March 19, 2002. The legislature is in charge of both congressional and legislative redistricting, but will appoint a committee in 2001. The committee is made up of one member from each caucus in the legislature. The governor has veto power over both congressional and legislative district plans. The state has a redistricting webpagefor citizens with information about laws. Legislative committee hearings will be open to the public, and the Capitol's Geographical Information Service Division plans to supply the redistricting software that the legislature uses so that citizens can draw up their own plans. Also, visual maps of the legislature’s proposed plans are available to the public in electronic form and online . There is also a webpage for the Governor's Citizen Advisory Commission on Redistricting. Redistricting in 2001-2 promises to be intriguing from a political and public interest perspective, with all three branches of state government controlled by a different political party. With this lineup, it is easy to envision Minnesota’s redistricting being settled in court, as it was settled in a messy process in 1991-1993. Conversely, Independence Party governor Jesse Ventura could use his office to work out a more equitable plan that both parties could accept. Regardless, Democrats may be nervous; they hold a 5-3 edge in the House delegation despite only two districts leaning clearly to Democrats. Litigation involving Minnesota's state legislature and congressional district plans was extensive and remarkably convoluted in the last redistricting cycle. In summary, both plans were simultaneously considered in state and federal court. The governor attempted to veto the Minnesota legislature's state legislative plan in 1991 but it was delivered too late. A congressional plan drawn by the state court was finally put in use for the 1992 elections but only after a quagmire of interference from a federal court that the U.S. Supreme Court said was "rac[ing] to beat the state court to the finish line." After the 1993 Supreme Court ruling against the federal court role, the state court's plan was put into effect for the 1994 elections. 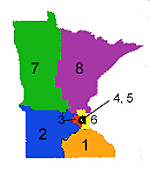 Minnesota House of Representatives bill number 1012 in 2000 was an attempt to create a 7-member advisory commission responsible for redistricting. The governor, and six members of the house and senate would have been appointed by a majority of their respective houses in the legislature to serve on the commission. The legislation failed.